Erin graduated from the Georgia Institute of Technology in 2001 with a degree in Biology, and then went on to pursue post-graduate work at Midwestern University in Glendale, AZ where she completed her Master of Medical Science in Physician Assistant Studies in 2006. After graduation, she practiced in orthopedic surgery before entering the field of Dermatology. 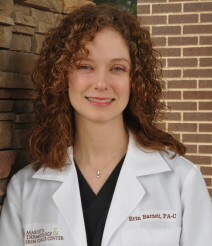 Erin specializes in general and surgical dermatology, and is a member of the Society of Dermatology of Physician Assistants, and Georgia Dermatology of Physician Assistants. In her free time she enjoys hiking and traveling with her husband.